Adam Schiff put himself in the political cross-hairs of President Donald Trump. And he won’t like the outcome. Schiff is the hyena who leads his clan and prowls the plains. Absent a male lion, hyenas intimidate prides of lions often chasing them off kills. However, when a male lion shows up, hyenas know to keep their distances. But occasionally one pushes the envelope, and gets too close. That’s what happens to one unlucky hyena in this graphic video. Note that other hyenas show up during the mauling. However, none dare challenge the male lion. This scenario sets up well what current develops in the political Serengeti. And Adam Schiff is the hyena who gets just a bit too close to the king of the jungle. One day after President Trump decried what he called “the politics of revenge” and “partisan investigations” in his State of the Union address, Democratic House Intelligence Committee Chairman Adam Schiff announced a new, wide-ranging probe into the president’s foreign business dealings and Russian election meddling. The move was fiercely condemned by Trump, who called Schiff a “political hack” on a partisan search-and-destroy mission. Two words foretell the demise of Adam Schiff. Political hack. Trump doesn’t come upon things by chance. He’s a very studied deliberate person. And when he finally targets something, their days are numbered. For example, during the campaign Trump called out the porous Mexican border. Leftists have tried for almost 3 years to demonize the man, but to no avail. Trump’s steadfast stance on “build that wall” (or whatever Leftists want to call it) leaves Leftists dumbfounded. Surely he would have succumbed to being called a racist? A xenophobe? Inhumane? But Trump never falters. He set his sights on the problem. Now, he must solve it. Period. People complained about Trump involving himself in what they deemed minutiae. But it turns out that honoring the anthem, the flag, the country, our veterans means something. Particularly in light of how Democrats are now perceived as anti-Americans. Think Trump didn’t see that coming? Think again. And will somebody remind me of where Kaepernick is? In the follow on battle that ensued, Democrats are losing the border wall battle. Partly because Trump’s stance against Kaepernick and the NFL segued into the border issue. While they play Tommy Toughass publicly, understand privately they know how badly they are getting their asses kicked by Trump. Clearly, it’s only a matter of time before Trump gets his wall. But perhaps more importantly, Trump made it clear to Democrats and their most loyal base, black people, that he won’t put any special interest ahead of MAGA. I’ve discussed the litany of people and businesses who have gone against Trump. Most lie in a veritable wasteland. This is because, Trump knows what fights to pick. And when he fights, he fights to win. Adam Schiff will find out the hard way. In his demand for more materials, he re-litigates Democrats’ losing position. While most Democrats want the Russian collusion farce swept under the rug, Schiff plays hyena. The Intelligence Committee on Wednesday also voted to hand over a slew of interview transcripts to Special Counsel Robert Mueller that were generated by the panel’s previous Russia investigation, which was conducted under GOP leadership and concluded last March. That investigation found “no evidence” of collusion between the Trump campaign and the Russian government in the 2016 election. Republicans had previously voted to release the transcripts publicly, but that has been held up by an intelligence community review to ensure no sensitive materials are disclosed. 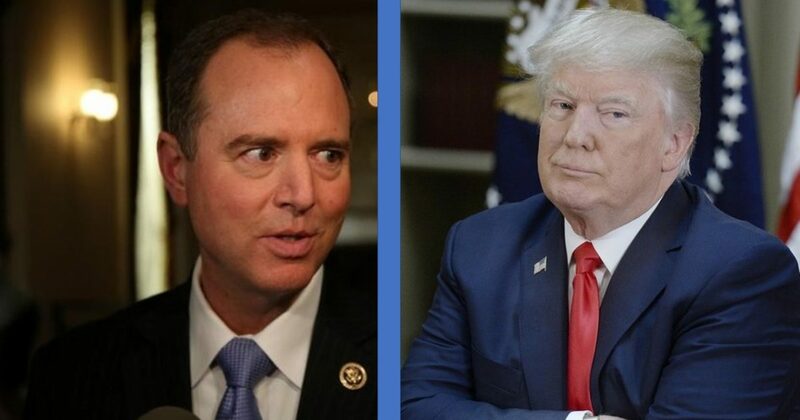 Although the precise nature of the new Democrat-led House probe is unclear, Schiff said the investigation will include “the scope and scale” of Russian intervention in the 2016 presidential election, the “extent of any links and/or coordination” between Russians and Trump’s associates, whether foreign actors have sought to hold leverage over Trump or his family and associates, and whether anyone has sought to obstruct any of the relevant investigations. Schiff has no escape. He doesn’t realize he’s gotten too close to the person who know rules the plains. And Schiff will be roadkill by the end of the year.